First stop, the grocery store! I’m hoping to get back to our regular $60/week budget this month, after a few months at $75/week and a couple of pantry challenge weeks in December where I just spent $35/week at the store. 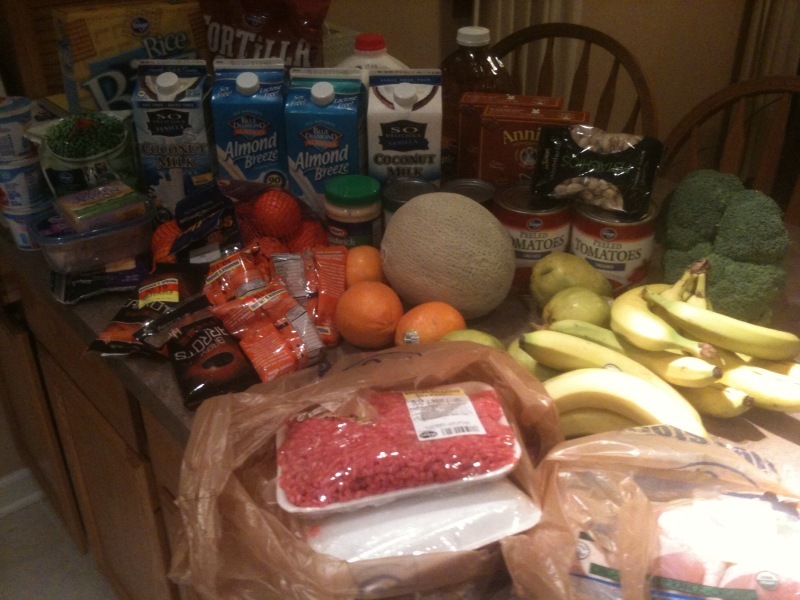 This week I got the basics, a few snacks, and a bunch of ground beef. I’ll be on the road most of this week and next, so I decided that I should make a big batch of spaghetti sauce and taco meat for the guys to enjoy while I’m away…more on that later today! Looks good. Where do you find coupons for ground beef? Okay, I need to know….what are you going to do with all those carrots? Are you making baby food? If not (thankfully my little lady is on table foods now), I’d love to know how you’re going to either use up or store that many carrots! Coconut milk is great! I usually get it fot 79 cents at a middle eastern grocery store. Great in smoothies and rice pudding. Add to chicken broth based soups or rice as part of the liquid and you’ve added an asia taste. I use a can of coconut milk with beef strips (or cubes), onion, carrot and potato in a crock pot stew with some curry paste, cumin, etc. My family loves it.